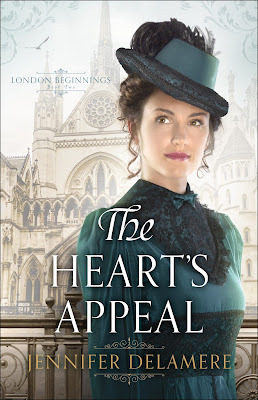 “The Heart’s Appeal” was a very good read and a pleasant second installment in the London Beginnings series. I had been a trifle hesitant because Julia isn’t presented as the most winsome character in the first book, with her abrupt ways and her dedication to her goals. Once I got to know her in this book, though, I thoroughly enjoyed the parts from her point of view and loved learning why she was so driven to succeed in her quest to become a doctor and cross the seas. Julia’s call to be an overseas missionary doctor is a big part of her character in book one, so I was interested to find out what made that her dream. So...book one, you ask. Yes, there is some of Julia’s personal background told in the first book, as well as the backstory of why the sisters have questions about their father’s fate at sea. But the story of her goal to be a doctor and the tale of her romance is entirely contained in this book, so while there are a few spoilers of book one and a few other small details, book two can be read alone without problem. This is a complete story in itself. The whole angle of Julia’s passion to heal bodies and her drive to learn how to be a better doctor was a delight to read. The detail of the tests and studies she had to do in order to enter the school for doctors was very interesting reading. Also, Michael’s portions as he seeks to find the meaning of true justice while establishing his practice as a new barrister is truly interesting. Delamere writes these portions so well that we can feel his angst as he worries through what right really is. I also loved Julia’s past of having grown up in George Müller’s orphanage with her sisters. It lent an interesting uniqueness to the backstory and it was a plus to find a recommended reading list in the back for anyone who wished to find out more about the orphanage. Then there was the side story of Michael’s sister and brother-in-law. I really enjoyed their bits and felt that it really added a lot to the story for me. Given her very Christian, faith-filled upbringing, I felt it to be a bit of a stretch that she allowed herself to feel so much attraction to a man who was agnostic. I just had a rather strait-laced idea of her and her initial reactions to him despite knowing the state of his faith didn’t quite compute. Because of that, it took longer for me to be invested in them as a possible couple. A few times some more modern American terms and some modern thinking crept in and tugged me out of the era, but overall Delamere did a good job with keeping in the mood/tone of Victorian England. Instances of kissing, drinking alcohol, and a number of detailed (but not graphic) medical situations. A train crash with injuries and an incident of police violence in a bad part of town. I’m glad I got the chance to read this book and am looking forward to the next book in the series. I recommend The Heart’s Appeal to lovers of rich historical detail, medical history, and those looking for a story that's hard to put down. Purchase your copy of The Heart’s Appeal on Amazon. Book 1 of the London Beginnings series, The Captain's Daughter is also available.